Fresh ingredients, great service and always something new to try. 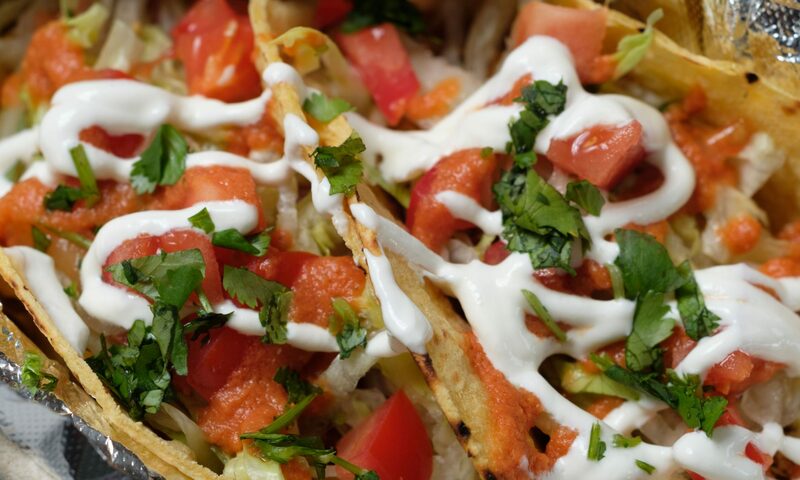 At Aaron’s Taco Cart’el we have something for everyone. Let us make your day with a great meal! Corn, flour or crunchy- Choose filling, cheese and toppings. 12” flour tortilla- Choose filling, cheese, rice, beans and toppings. Choose filling, cheese, rice, beans and toppings. 12” flour tortilla grilled with cheese- Choose filling and toppings. Homemade tortilla chips with melted cheese, choice of filling and toppings. Pork Carnitas- Slow roasted Pork in marinade of peppers, onions, cilantro, chile and fresh citrus. Mojo Chicken- chicken marinated in a puree of onions, peppers, cilantro, jalapeno and lime juice. Gringo Beef- Ground beef simmered in a blend of taco spices and onions. Pico de Gallo- tomato, onion, jalapeno, cilantro and lime. Cilantro Slaw- cabbage, onions and fresh cilantro with lime. Salsa Roja mild- Stewed tomatoes blended with onions, jalapenos, lime juice and cilantro. Salsa Roja HOT- Stewed tomatoes blended with onions, habaneros, jalapenos, lime juice and cilantro. Salsa Verde- tomatillos, avocado, jalapeno, cilantro and lime. Aaron Lamb is a classically trained chef, he studied at New England Culinary Institute in Burlington Vt. Since then, he has worked in four states and eight cities, gaining knowledge and experience from all aspects of the culinary business. From corporate food manufacturing to the mom and pop pub, he grew fond of the taco carts in Southern California. This would soon become his favorite cuisine. After working twelve hours a day in a kitchen, the last thing he wanted to do was to come home and cook himself a meal. So he quickly became a regular to the local taco stands. This is where the idea of bringing delicious, quick, and inexpensive tacos to New England came to be. After moving back to the Boston area and growing tired of the restaurant hours, he then decided to make the Taco Cart’el dream a reality! !